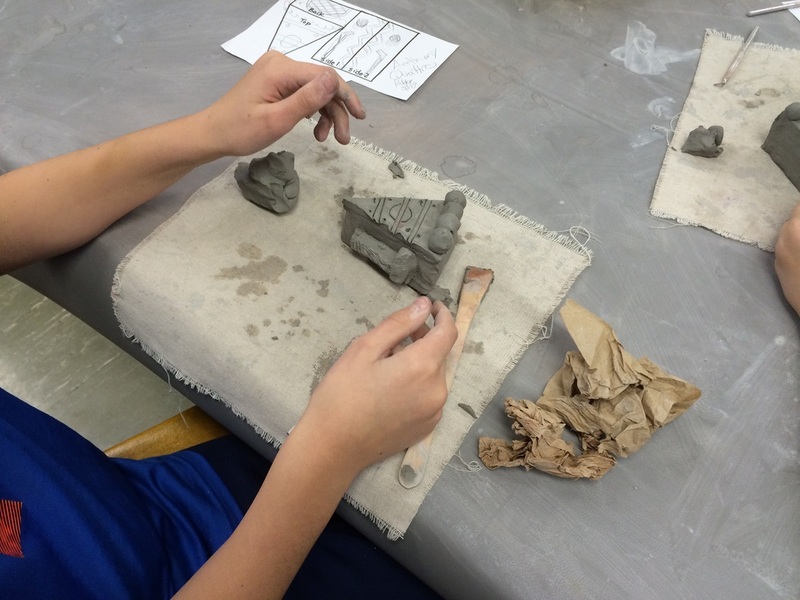 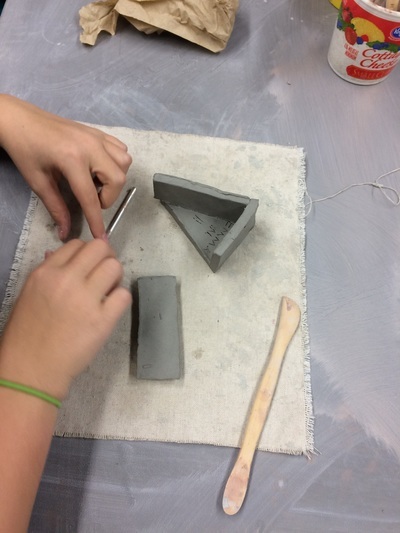 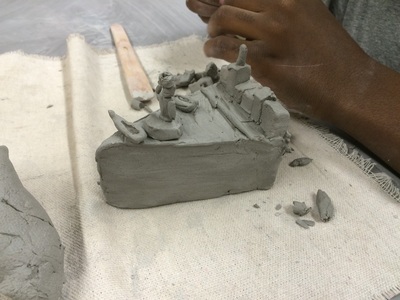 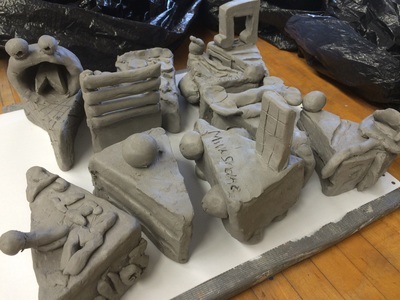 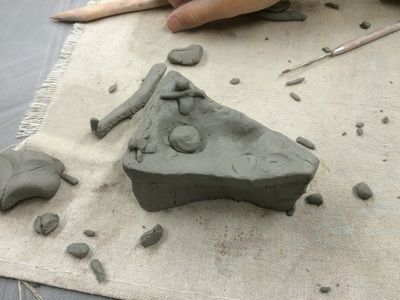 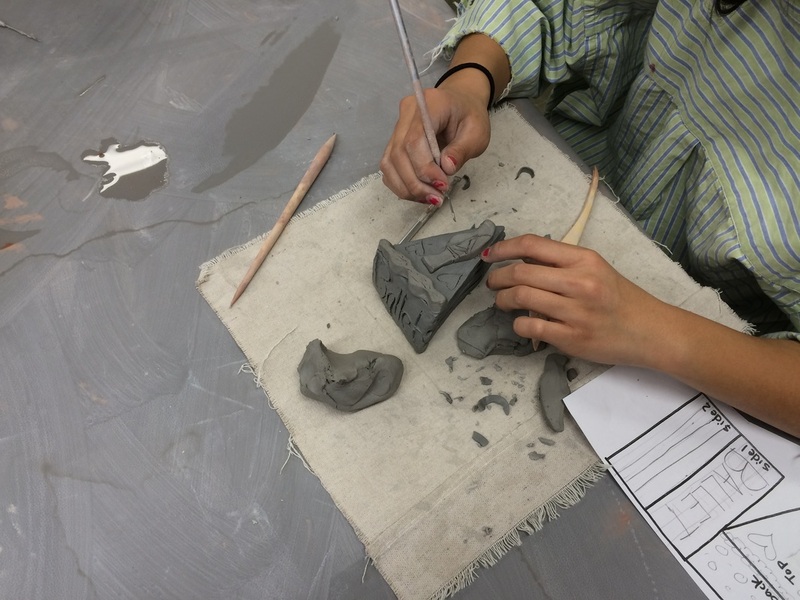 Students used the slab clay working technique to create their 3-D cake slices out of flat pieces of clay. Once the cake slices were assembled, students used the scratch and attach method from last year to add their additions to their cake slices. Each cake slice tells a different story about it's creator! 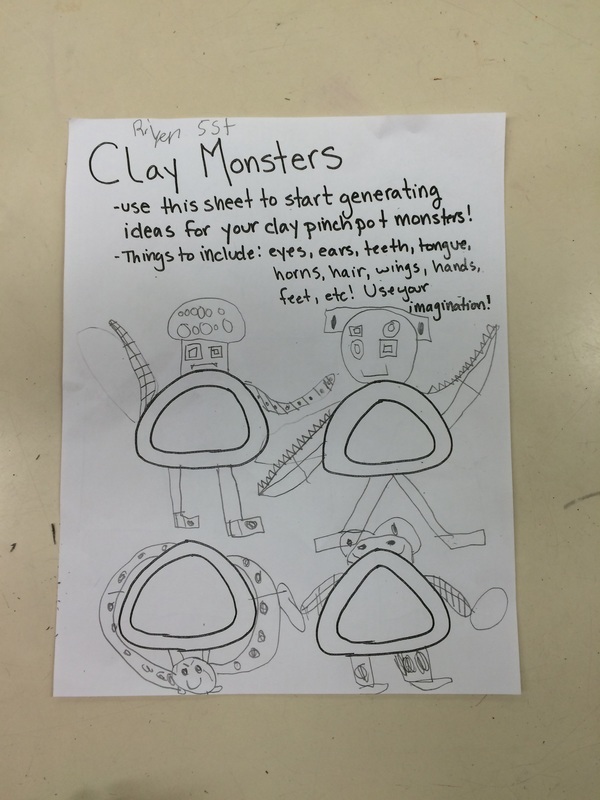 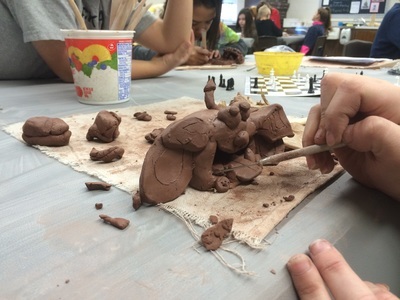 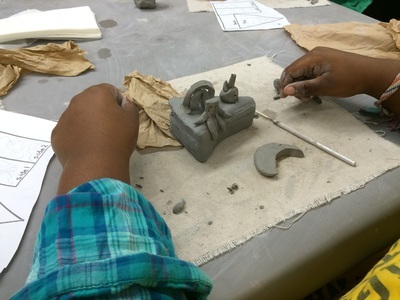 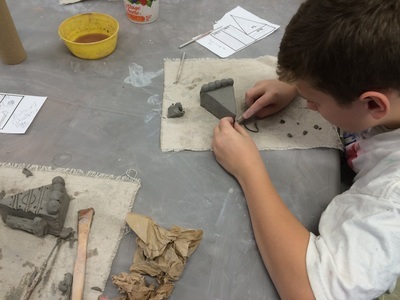 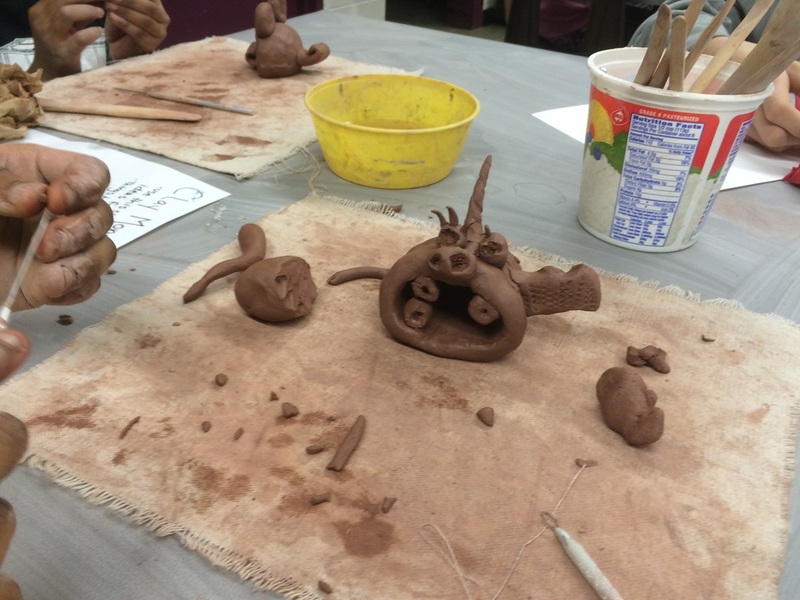 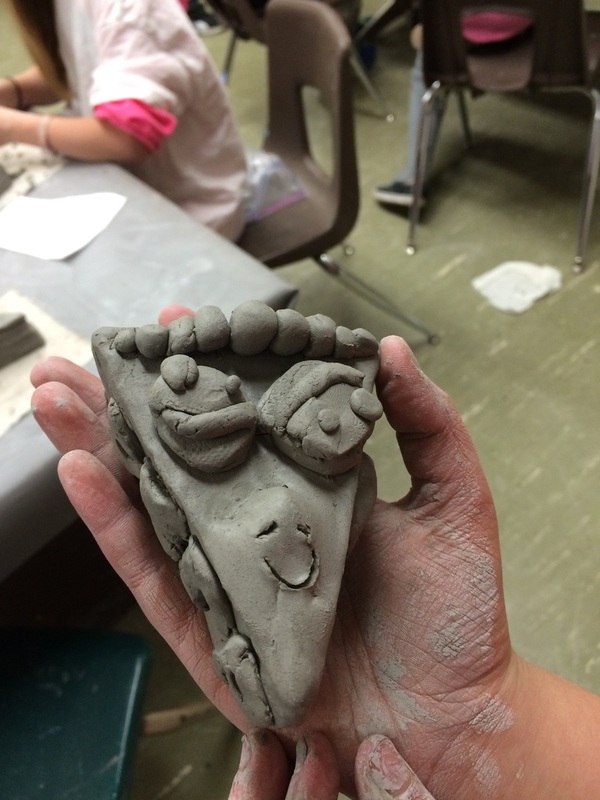 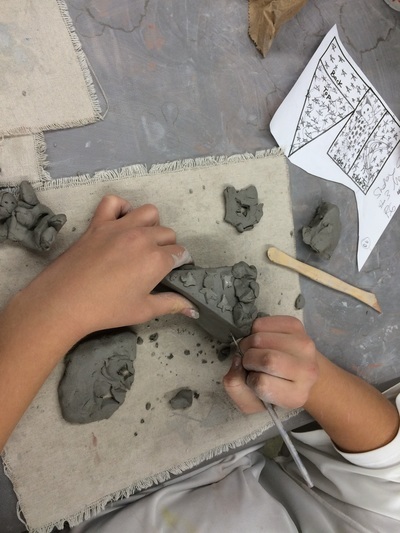 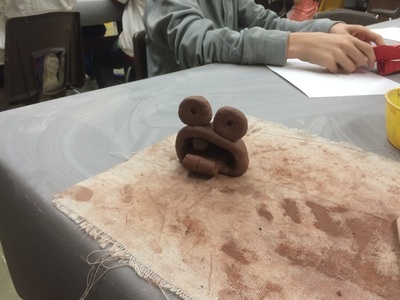 During the month of November and December, 5th grade students learned how to create pinch pots and started using using the scratch & attach method to add details to their monsters using Terracotta clay. 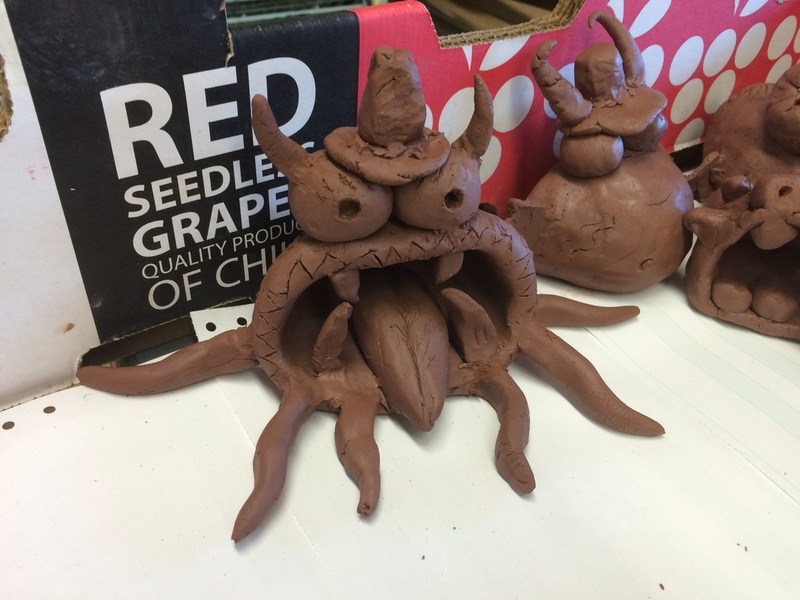 The monsters turned out amazing! 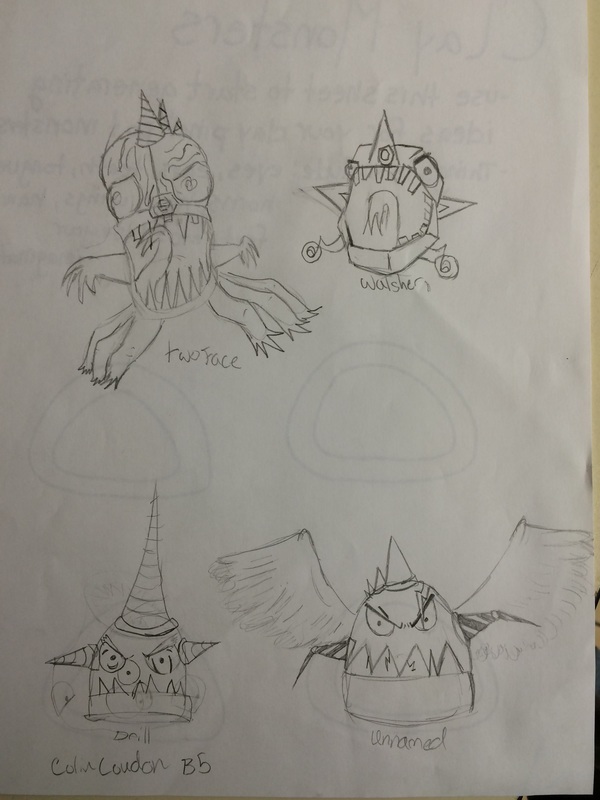 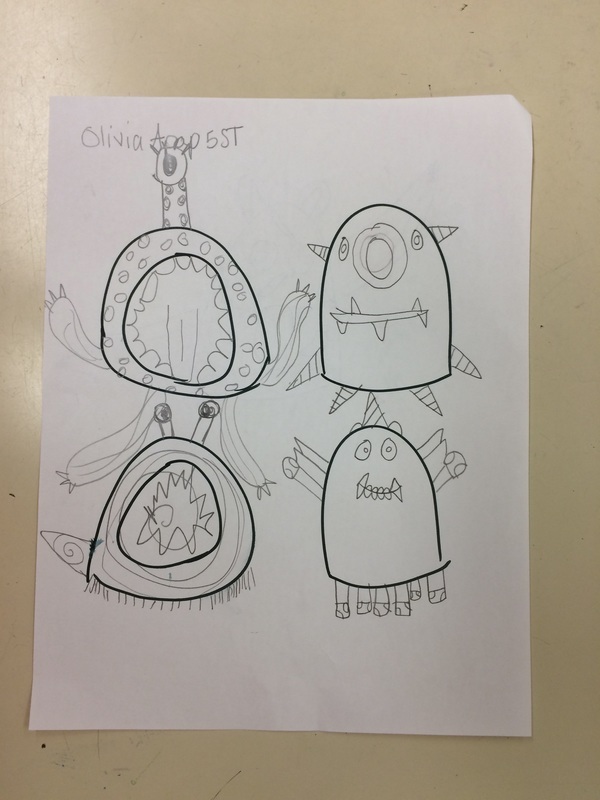 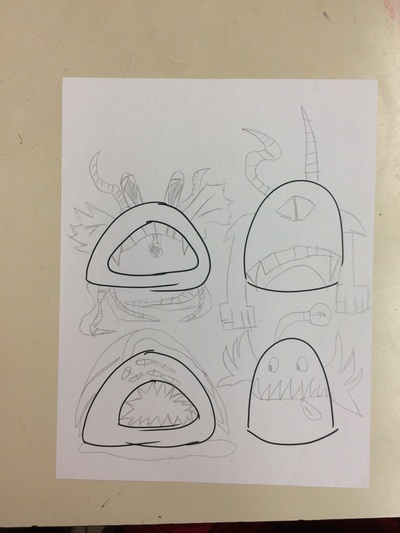 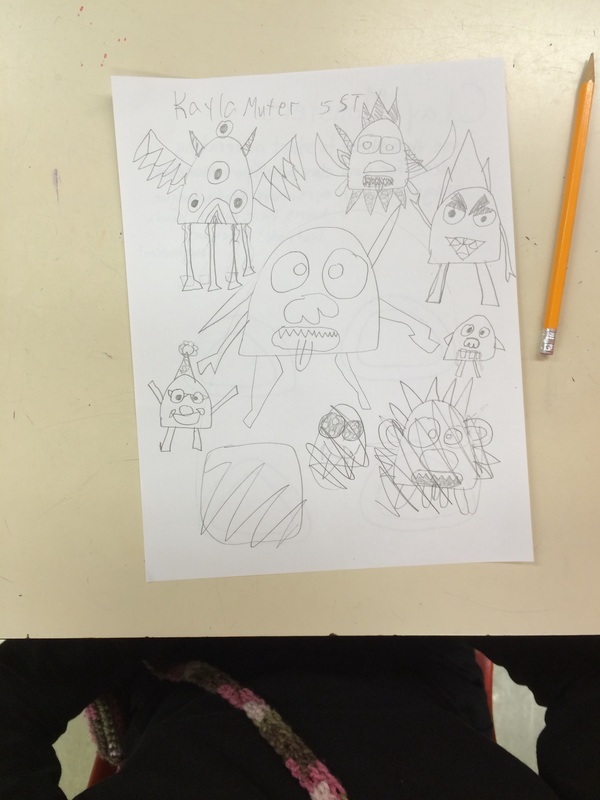 Some students decided to go all out and create textured monsters with multiple additions and others decided to keep theirs simple, but every monster has its own personality! 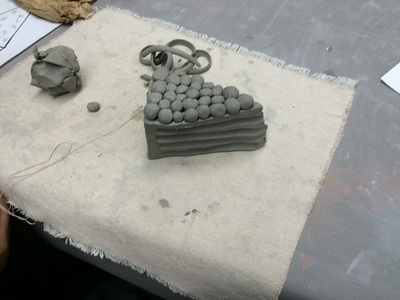 More pictures to come during the glazing stage. 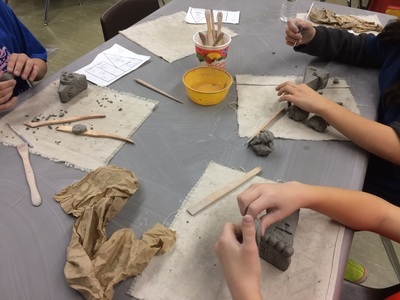 We are starting clay this week! 5th grade students looked at the work of James DeRosso and watched a short video about his design thinking process (below). 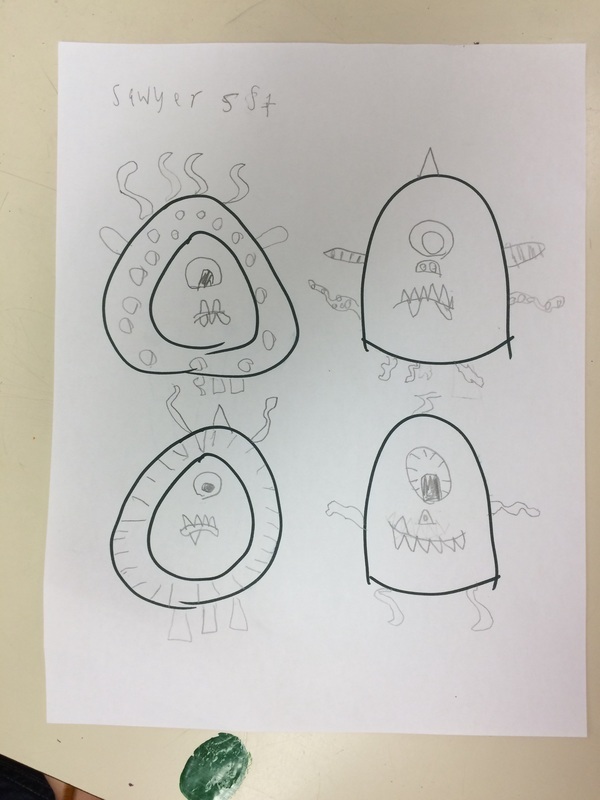 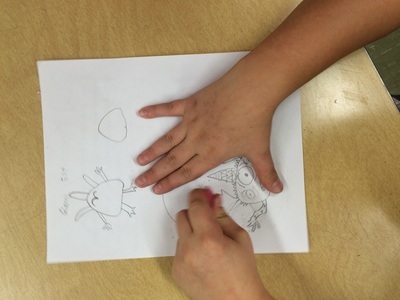 Then they started to sketch out their own ideas for their monster using one of two formats of a pinch pot. 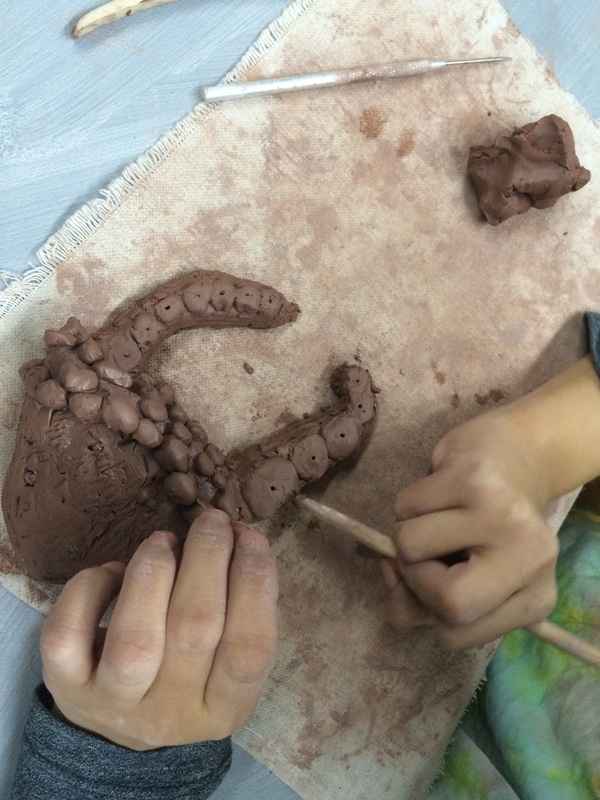 Either the opening of the pinch pot will be the mouth of their monster or the base. 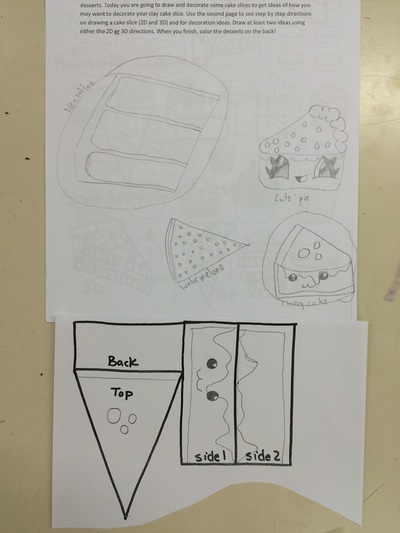 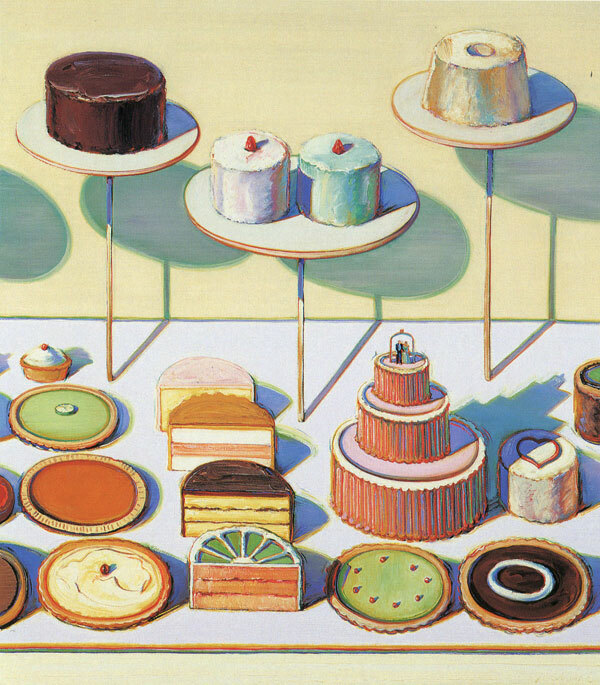 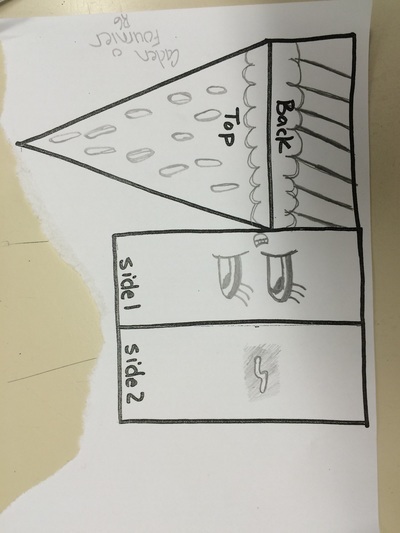 6th graders are starting clay as well, this year we are doing the cake slices again based of the work of Wayne Thiebaud. 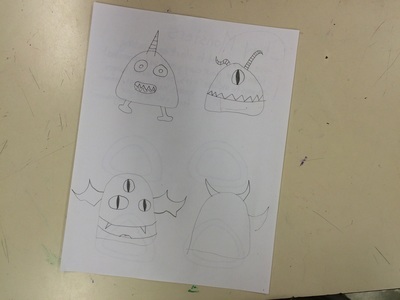 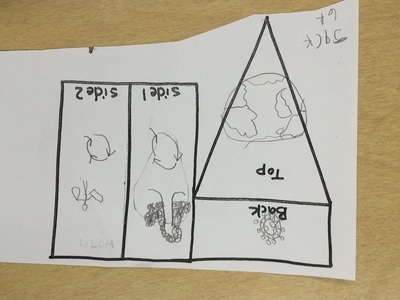 Students were challenged to tell me something about themselves using their design. 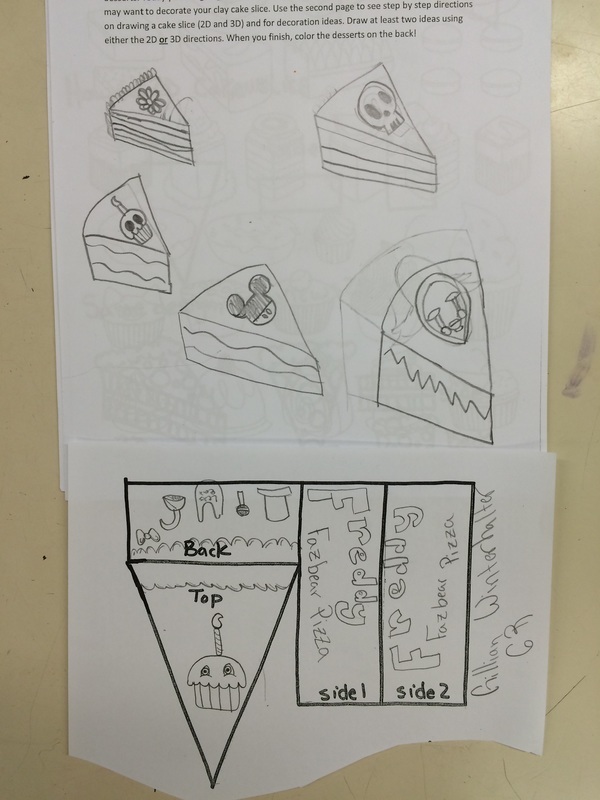 We will be working with slabs of clay to create our cake slices then adding the details with scratch and attach. 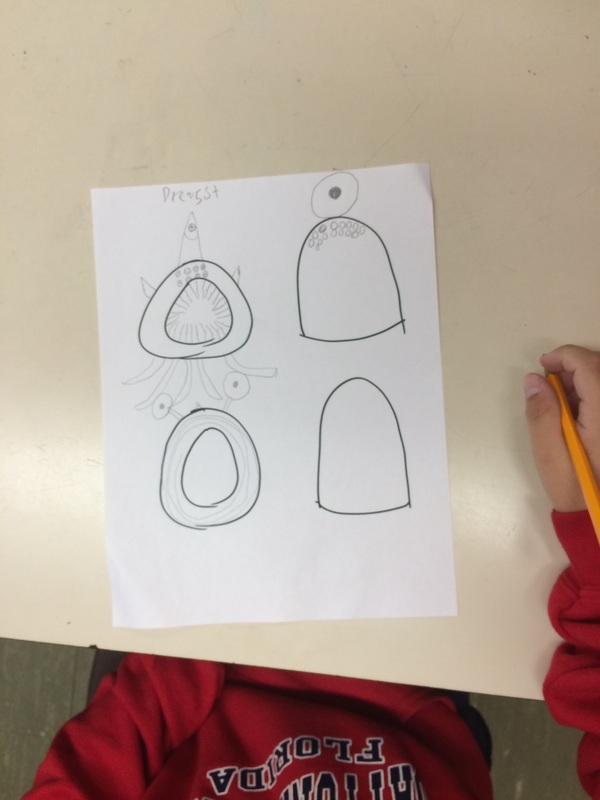 Students are VERY excited to start this project! This year at Johnson, we are doing a fundraiser for the art room to get some supplies that we otherwise would have to go without. 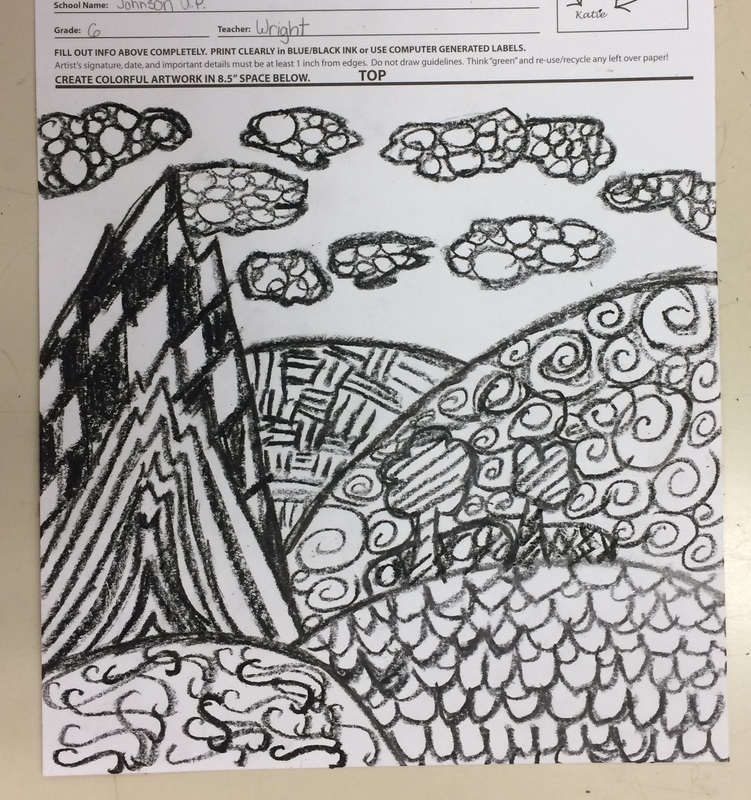 Artwork is being sent out this Friday and catalogs will be here by the second week of November! 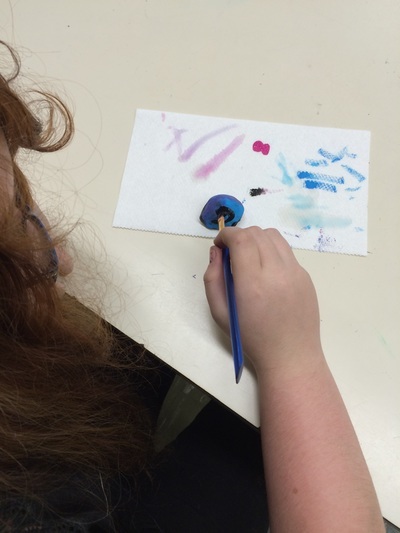 Fifth grade and Sixth grade are both doing a wax resist with watercolor. 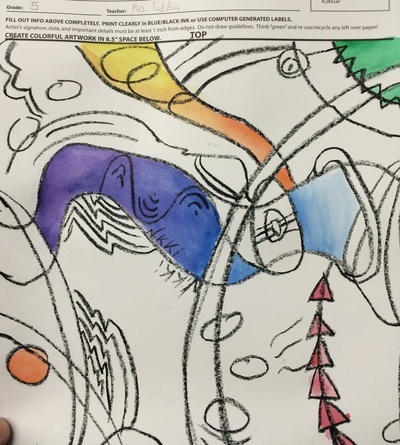 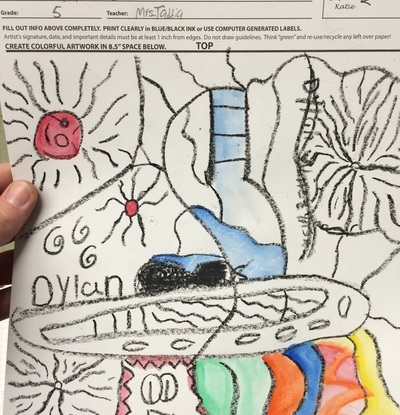 Fifth graders started by talking about Wassily Kandinsky and his ability to paint from music. 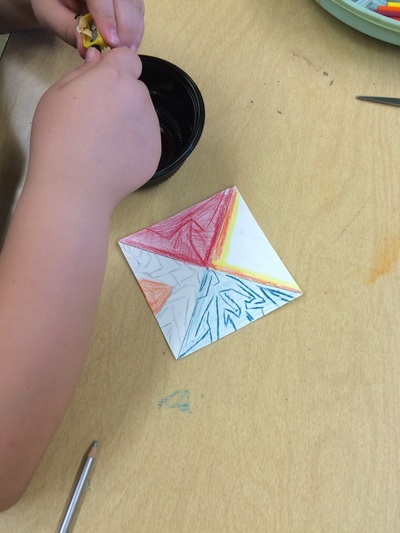 These painted compositions are considered to be some of the first pure abstract art. 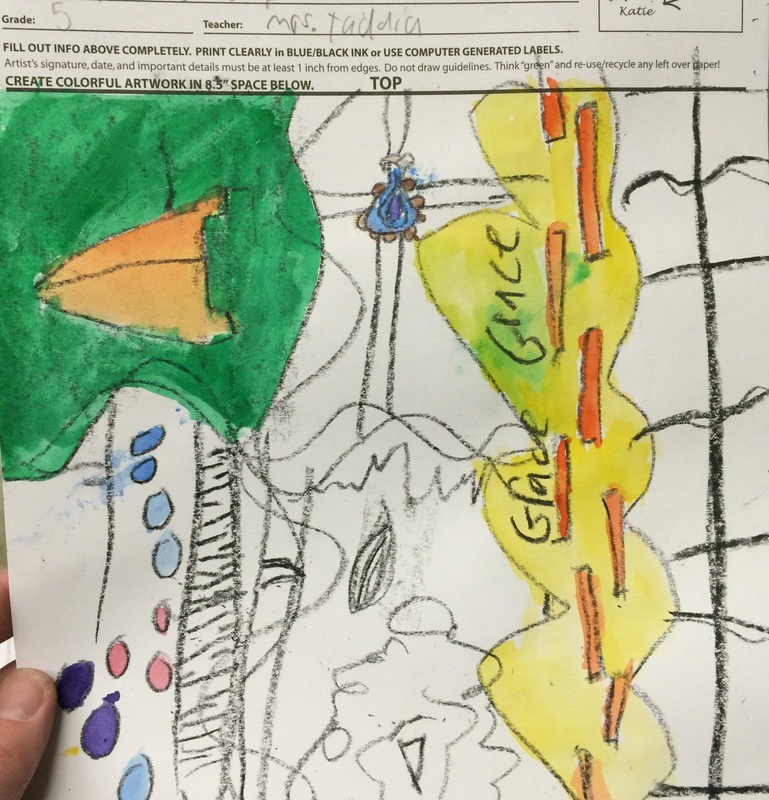 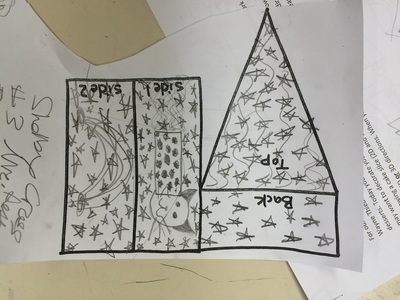 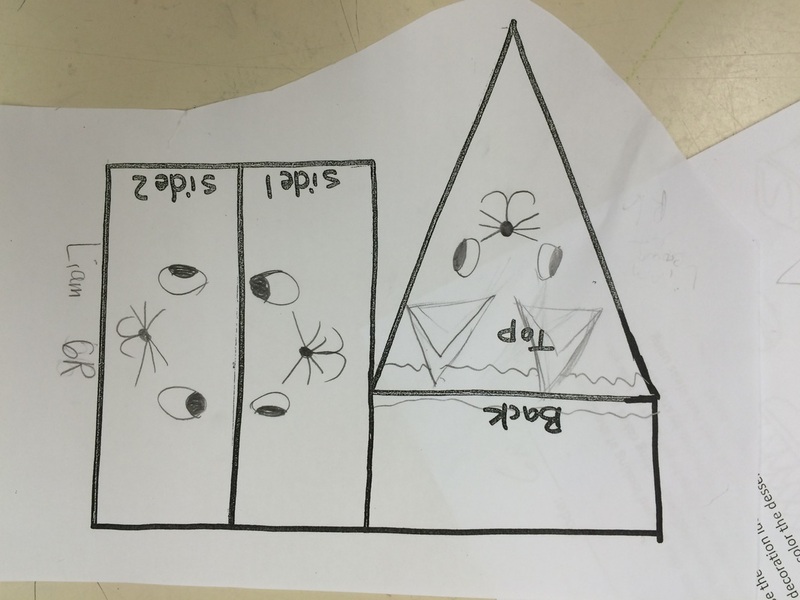 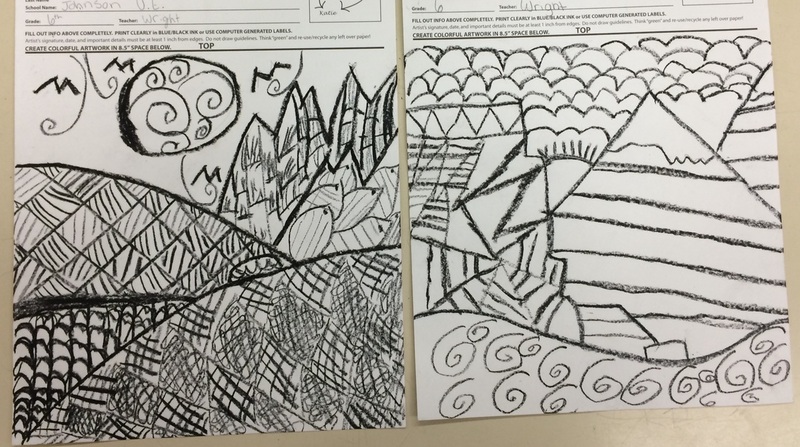 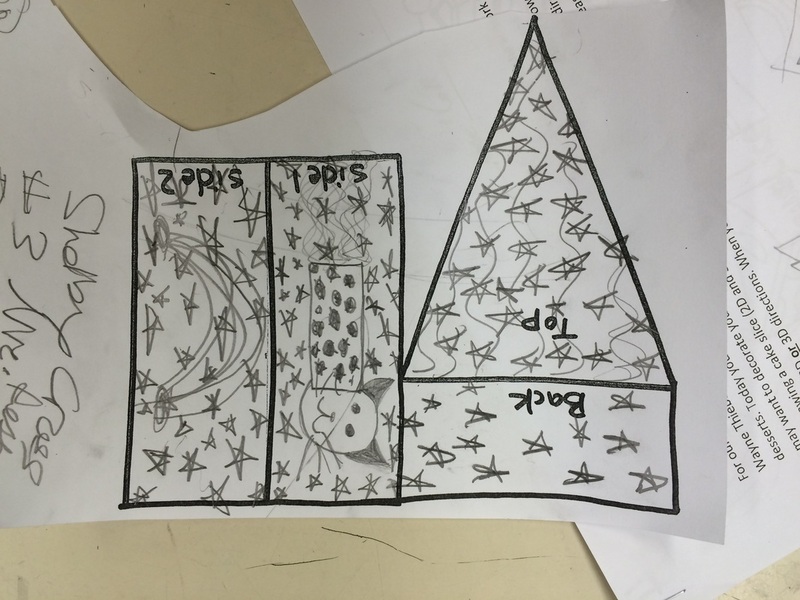 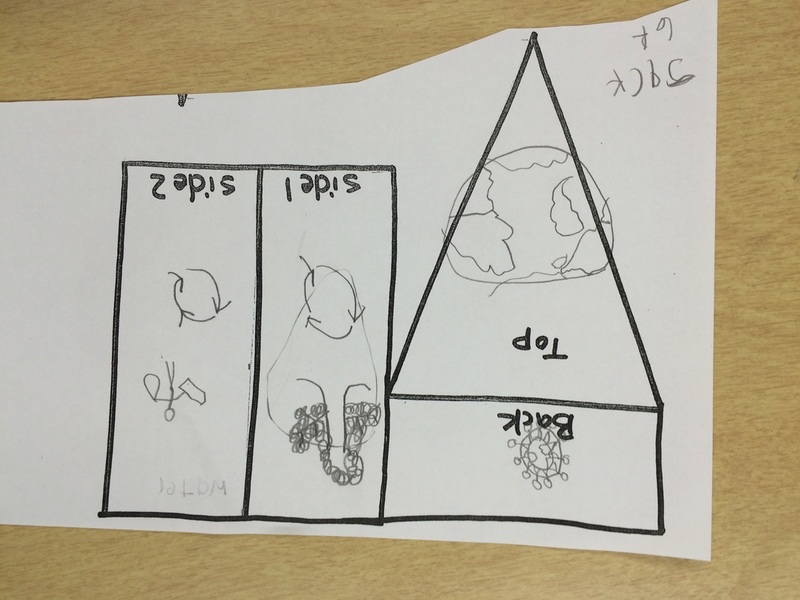 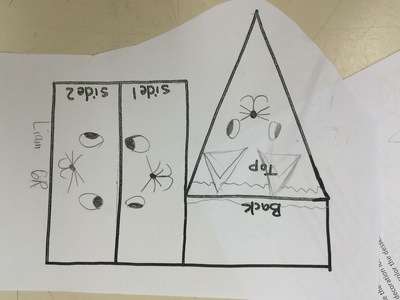 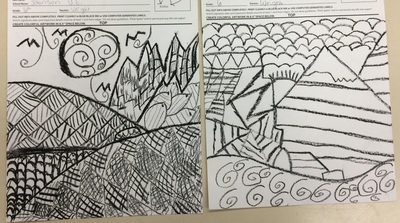 Students listened to two different songs and drew from both, focusing on line and shape. Then we used watercolor to add the wonderful color you see! 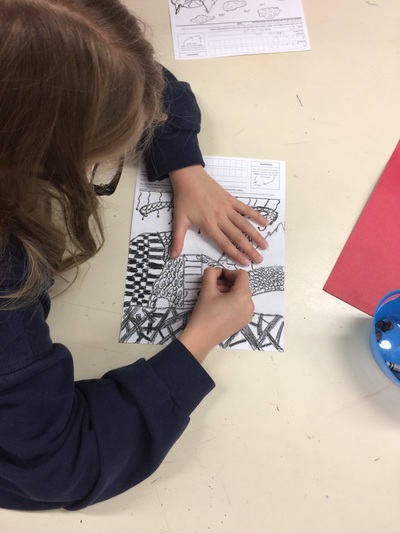 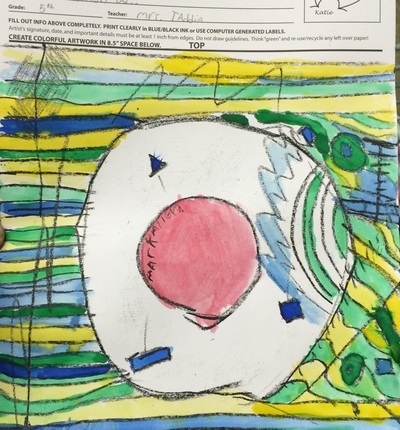 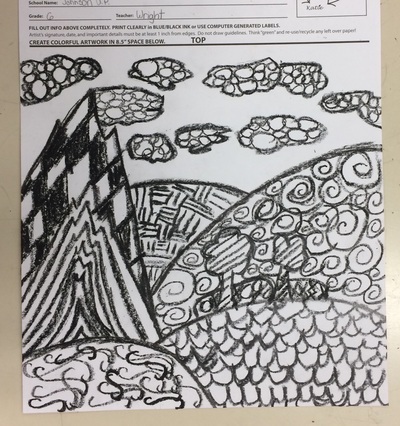 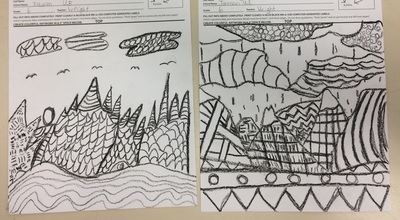 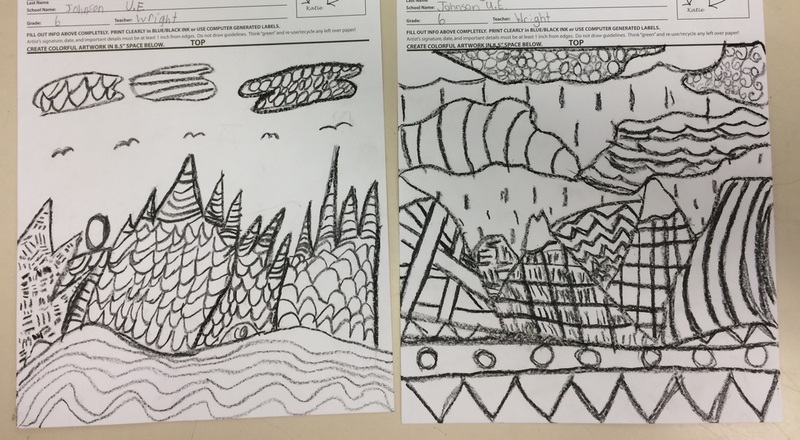 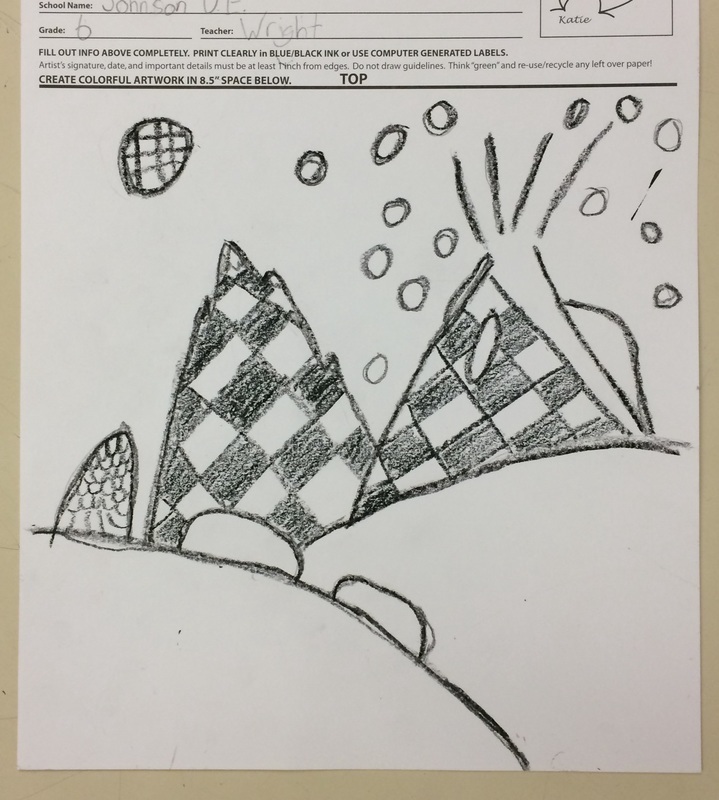 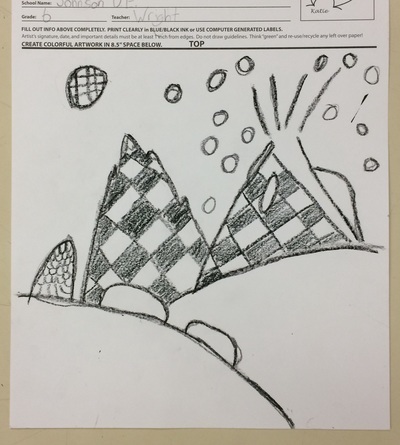 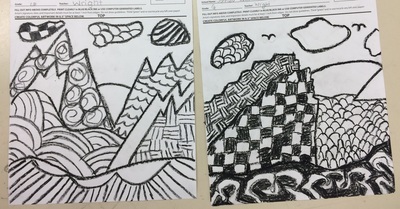 Sixth grade students learned how to create the illusion of depth by overlapping shapes and lines. 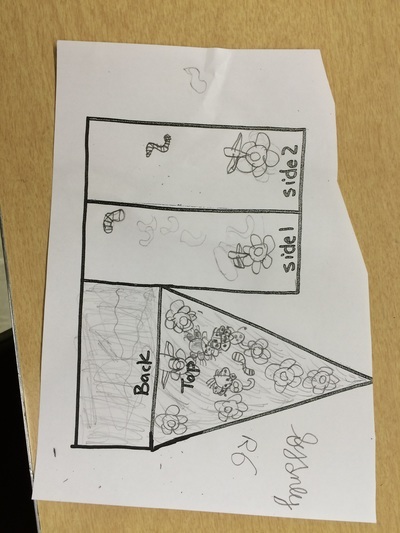 We talked about how to create a foreground, middle ground and a background. 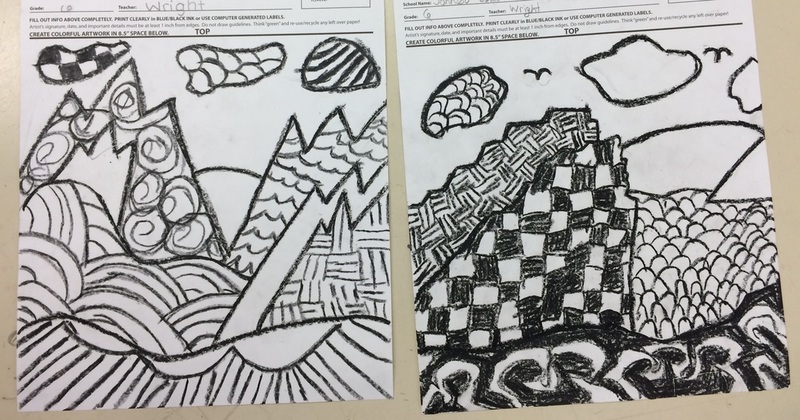 Once their landscape was mapped out, they made it abstract by plugging a different pattern or design into each layer. 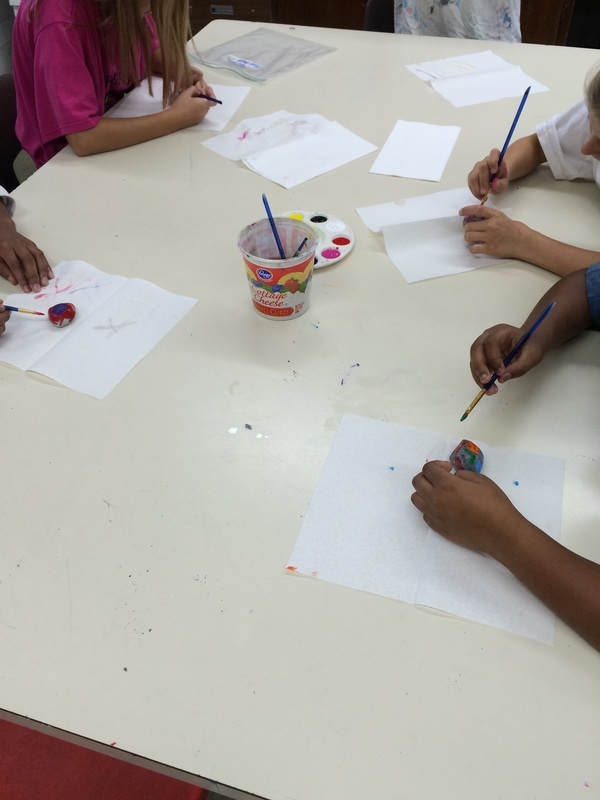 The landscapes were finished off with watercolor in each layer. The pinwheels that students created for International Peace Day were on display Friday for our annual fun run! 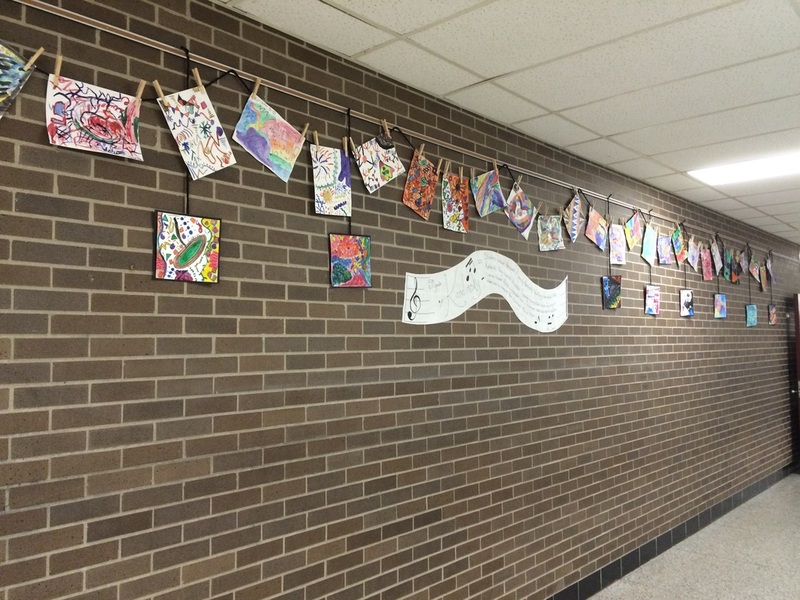 They looked wonderful and the students enjoyed checking out their art while walking and running for the annual school fundraiser. If you missed it, check out the pictures! 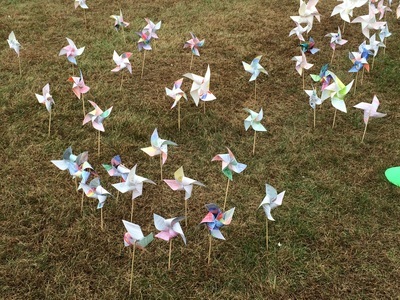 ​Every year at Johnson Upper Elementary we celebrate Peace Day which is September 21st. 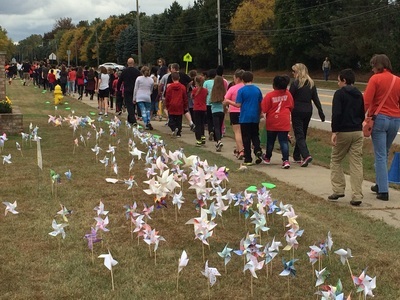 This is a good chance for the teachers and myself to talk to the students about what peace is and how it can be shown in our school community. 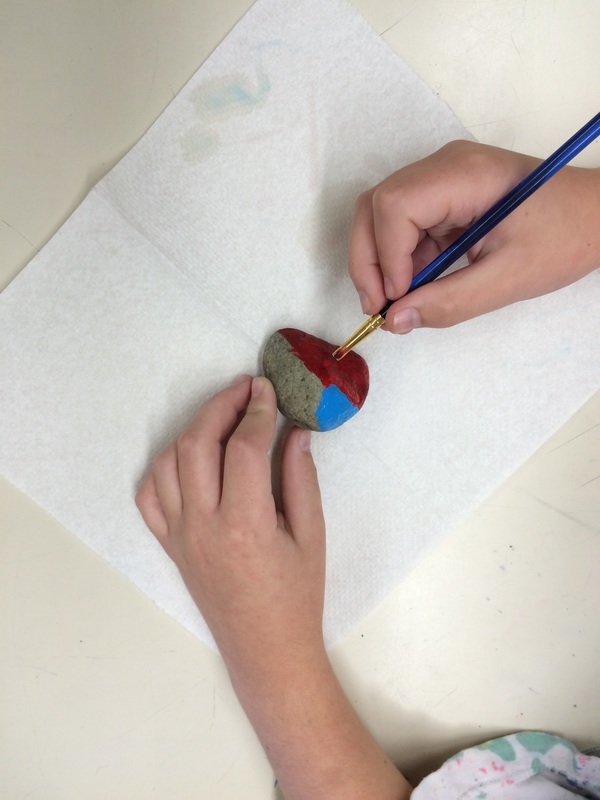 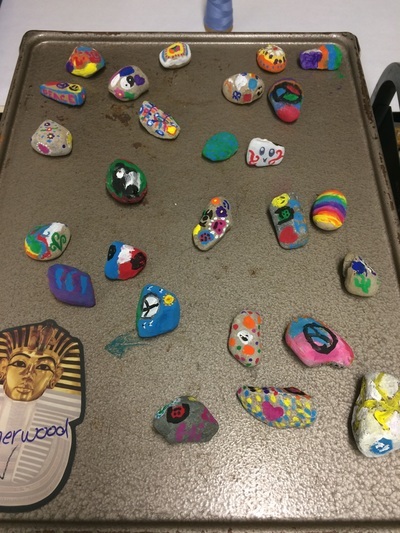 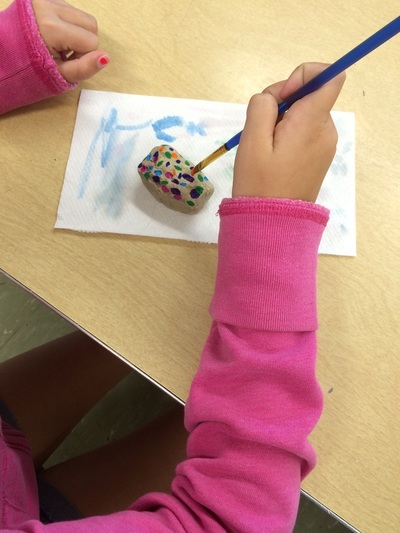 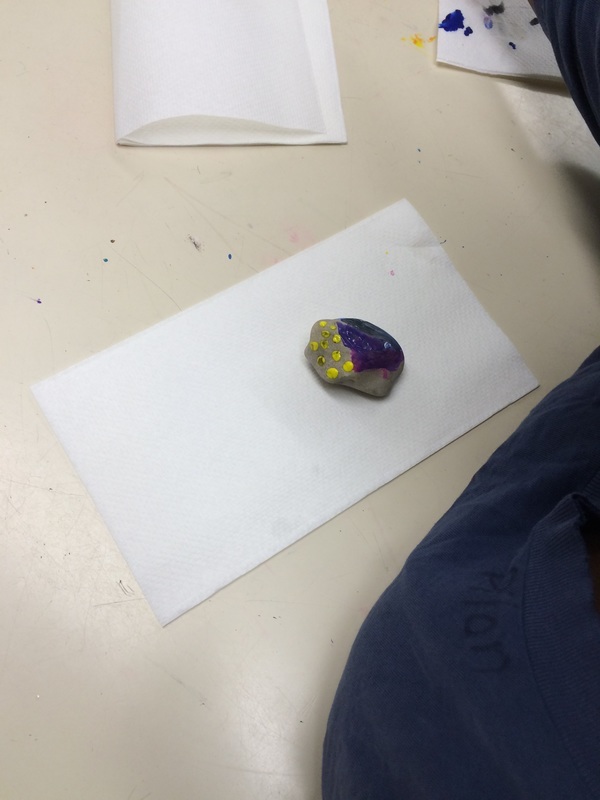 This year 5th graders made some wonderful peace rocks that will be showcased in our peace garden here at Johnson. 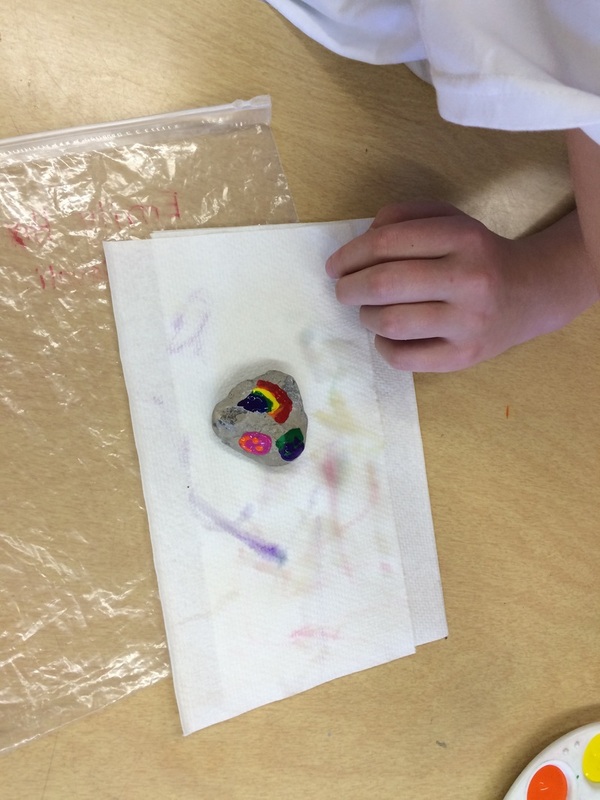 In the garden there are trees, bird feeders and now a nice rock garden that surrounds a peace pole. 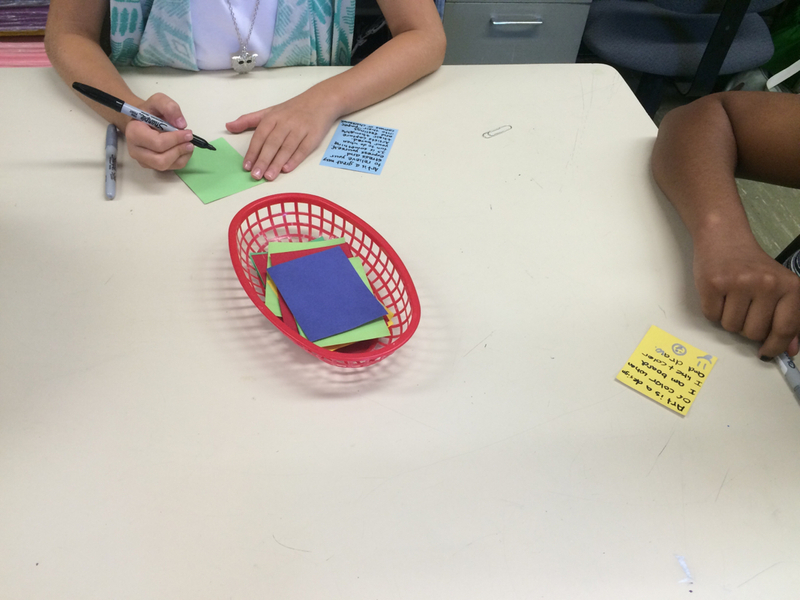 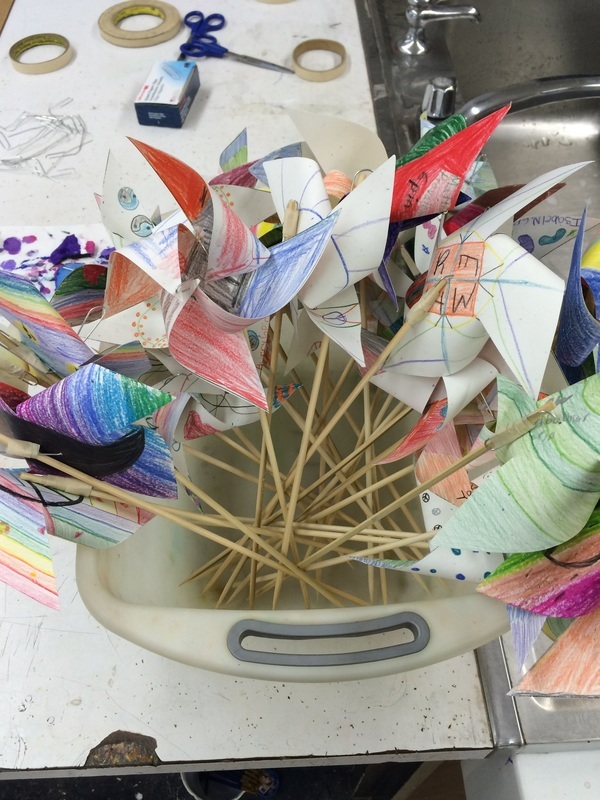 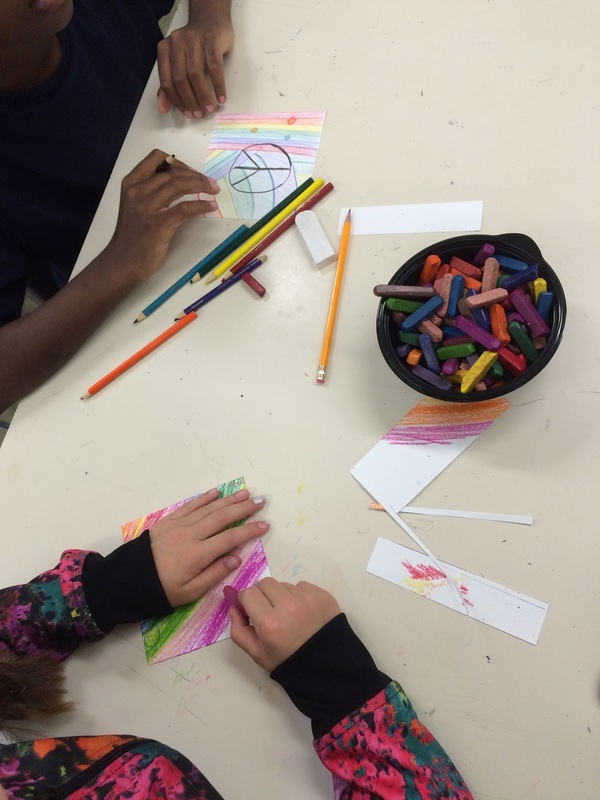 Sixth graders at Johnson created pinwheels with words and colors they thought were peaceful. 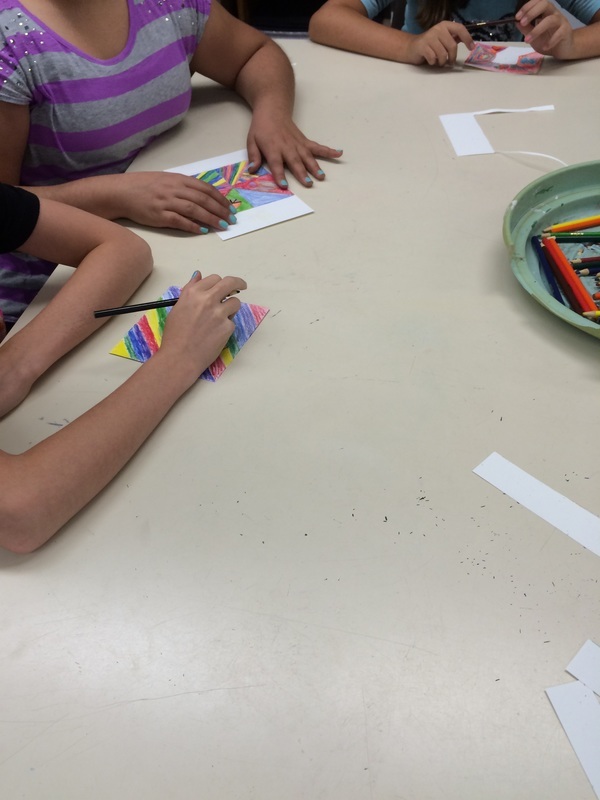 The students really stepped up to the plate this year and helped each other make the pinwheels! 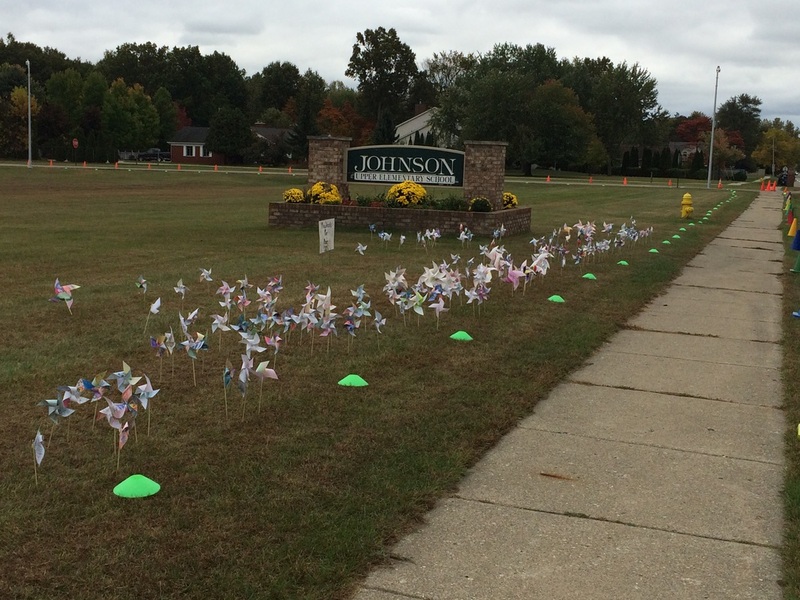 The pinwheels will be on display in front of the school during the Fund Run October 9th. 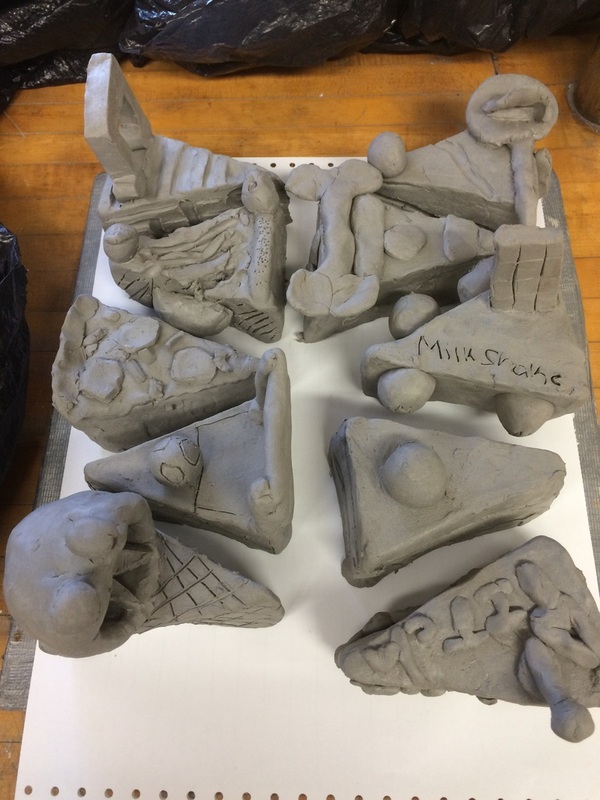 These beautiful creations will be coming home shortly after, the weather is too fickle this year to leave them out for long! (More pictures to come once they are set up for the Fund Run. 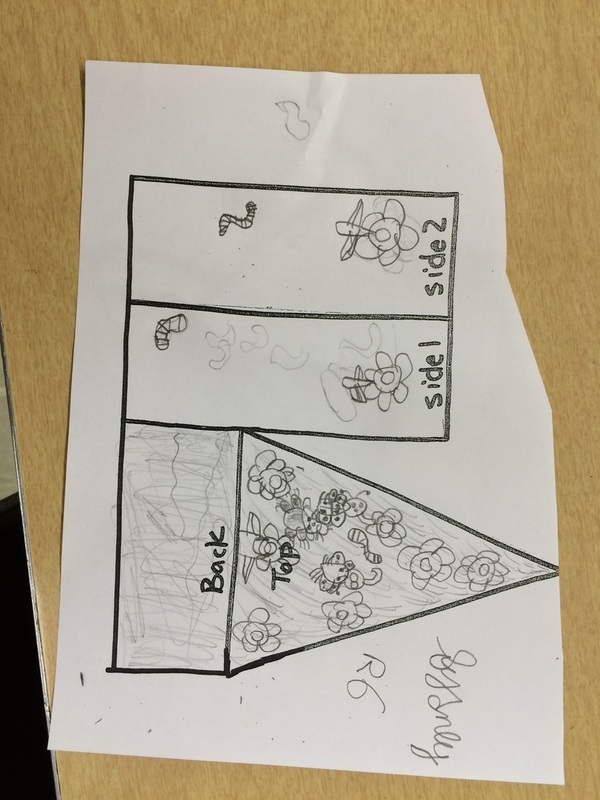 Start of a new year! 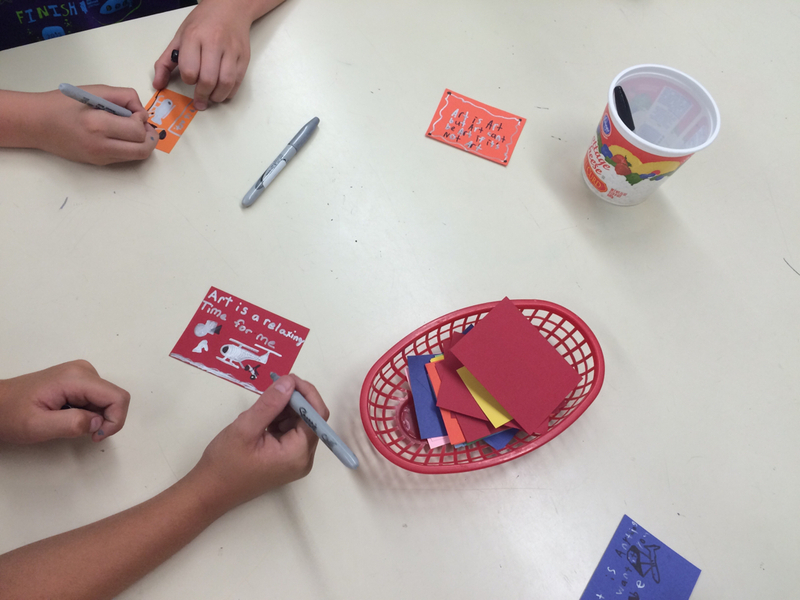 The new school year has started at Johnson! 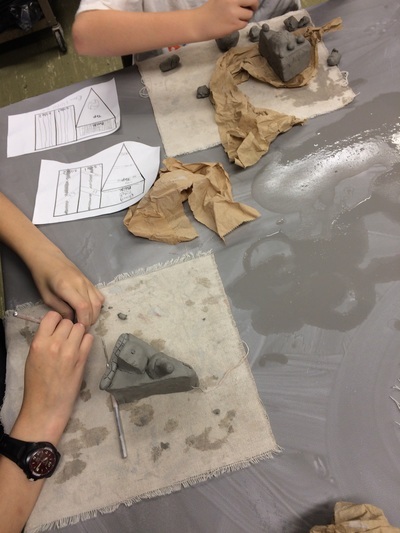 This week I will be talking about our plans for this year with students. 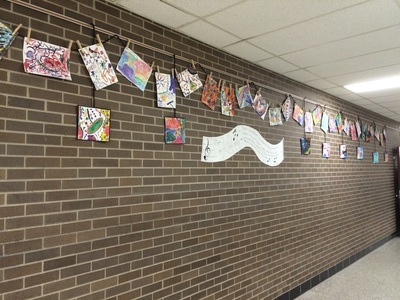 Students will also be answering the question "What is Art?" 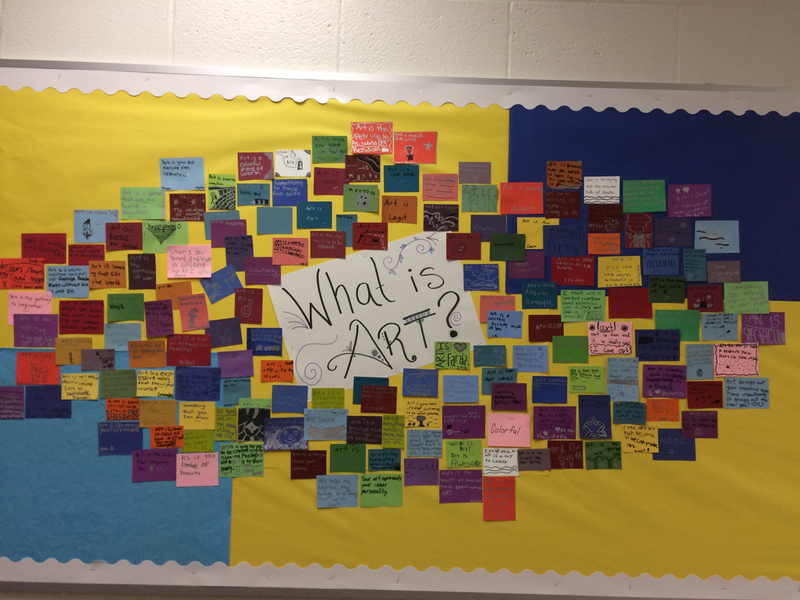 The answers will be posted on a bulletin board outside the art room, come check it out if you get a chance! Once we are finished with that, we will begin talking about Peace. 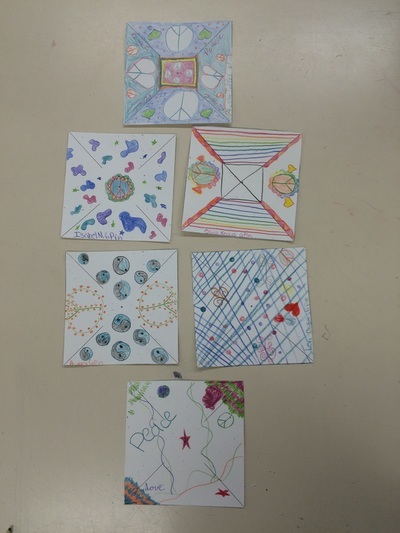 Here at Johnson, we celebrate National Peace Day which is September 21st. 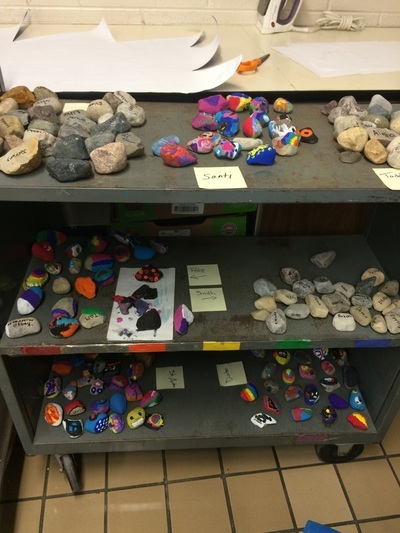 Fifth graders will be making peace rocks for our peace garden at Johnson and sixth graders will be creating pinwheels that will be displayed outside the school starting on the 28th of this month. Pictures to follow!